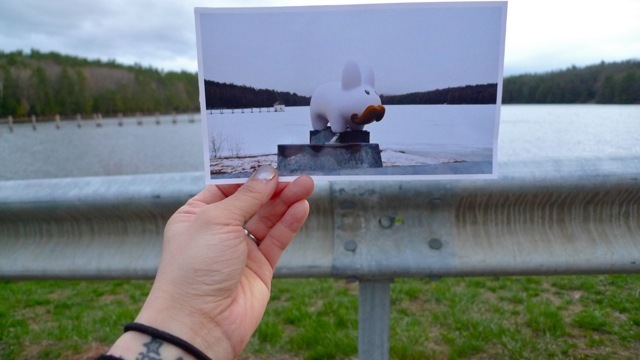 Pipkin revisits Minards Pond...in spirit. The day is still gray, but the pond is no longer frozen over. Hopefully the next photo will show blue skies or a colorful sunset reflected in the water. Maybe I'll attempt a photo within a photo within a photo. It was very windy today which made taking this photo really challenging! I also didn't perfectly align the metal beam that Pipkin was on to the beam here, but like I said, it was really windy. I had taken sooooo many photos before this one, and decided I wasn't going to get a good shot so I stood up to leave. Just as I was about to walk away the wind died down a little. I whipped around and snapped a few more pics while the wind was calmer, and didn't realize I had moved a couple steps over. Oh well! This was the best that I could do. Next time, labbit. Next time.